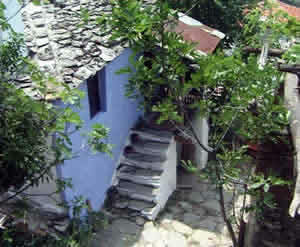 Private holiday house Villa Kavanosi in Kazaviti on Thassos island Greece for rent. Holiday House Villa Kavanosi in Kazaviti on Thassos island in Greece, for max. 3 persons. A cozy , traditional house with massive walls of stone and clay. The aged beams of the roof construction are openly visible. Small balcony in front of the main door at the first floor level, accessible over stone steps from the stone paved path in front of the house. Another door to the outside at the ground floor level. The kitchen on the upper floor level connects with the living room through an archway. From the kitchen a narrow staircase leads to the ground floor bedroom with double bed (1,60 x 2,00m) and bathroom with shower. Across the path in front of the house, accessible over stone steps, a seating area and small garden with fruit trees and vine pergola is part of this holiday facility. The garden terrace is situated high above the foot path and is further secluded by an old wine-press between the path and the garden. From there the marvelous view towards west (sunset) reaches far beyond the sea to the Pangeon Mountain on the mainland. Narrow walkways extend from the house to the nature further uphill. Very quiet location. No car traffic can reach the house and its periphery. Walking distance from the village square app. 6 minutes. Garden Table with chairs, hammock. Here you find the seasonally changing ferry boat time tables..